I spent a lot of time learning, tweaking and adjusting my 6-max opening raising, calling and 3-betting ranges over the past year trying to identify good, conservative, but strong and aggressive ranges for mainly beginning and struggling 6-max micro stakes poker players. So after lots of work putting these together, trying to make them as simple as possible to follow, I am here to share them with you. The goal with these ranges is to be playing close to a 20/18/10 VP/PFR/3B game where (1) we are raising in a TAG range pre-flop, (2) we are not over calling too much, and (3) we are 3-betting aggressively for value with our value hands, especially when defending our blinds. Lastly, while we are 3-bet bluffing from time-to-time, it is not a big part of our game. 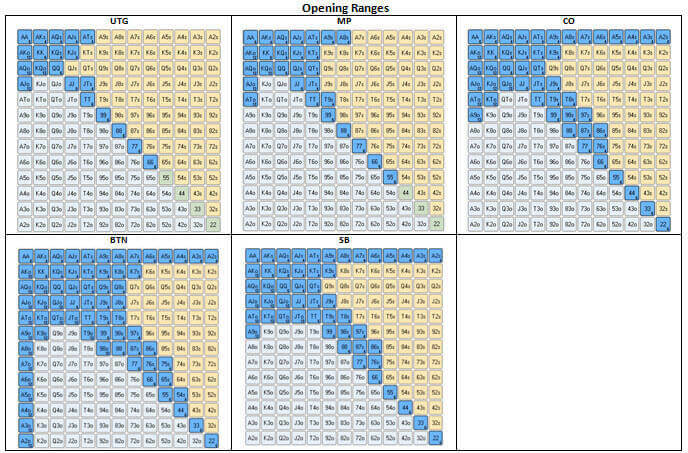 You’ll notice that our opening ranges are conservative, so if you want to open up your game, please feel free to play a wider range, especially in late position. Our goal with our calling ranges is to minimize our over-calling where beginning and struggling micro stakes players end of check/folding a lot post flop. With these ranges, we follow the Gap Theory with our Broadway cards and we also throw in some small pocket pairs and suited connectors / one-gappers for implied odds. 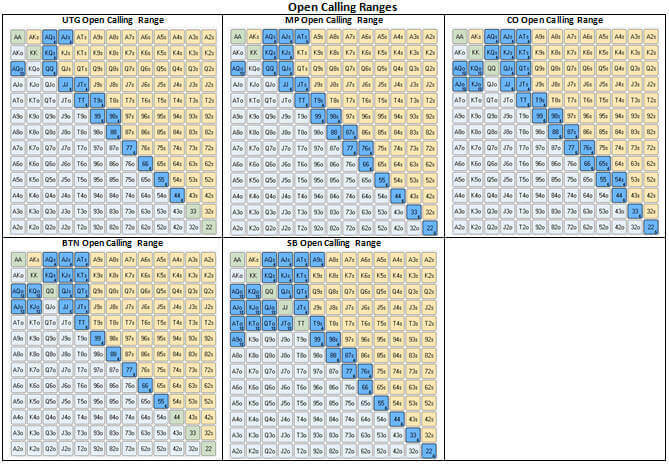 Note: When I say “UTG” Open Calling Range, I am providing a starting point range of hands you can call an open raise from UTG. The same goes for MP, CO, BTN, and SB. So MP Open Calling Range is not the hands you should call from MP, but the hands you can call from an open raise from MP. This is the same for my 3-betting ranges. So please don’t get this mixed up because it can be a bit confusing if you mis-read the diagrams. Our 3-betting range is a strong value-oriented game. You will notice that as our opponents open in later positions, we can 3-bet wider ranges for value, especially against BTN and SB opens. 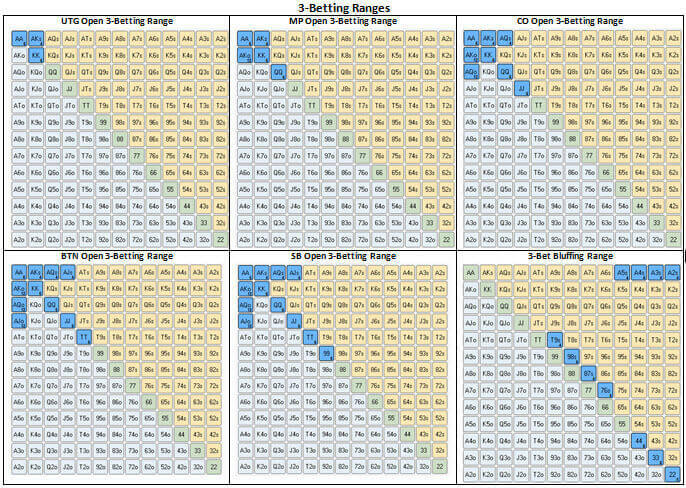 We do have a 3-bet bluffing range composed of small suited aces, 22-44 and a few combos of suited connectors. I do not recommend you 3-bet bluff that often unless someone is a habitual blind stealer that folds to a lot of 3-bets over a large sample size.